UTC to take second place in the Route du Rhum. The ecstatic look on Guichard's face revealed it all. The skipper had sailed his 40m by 23m across in a time of 8 days, 5 hours, 18 minutes and 46 seconds at an average speed of 21.96 knots, the fourth best time in the race’s history and 14 hours behind race winner Loïck Peyron. Guichard commented: “I had a great race and I gave it everything from start to finish. I really suffered, but I managed to keep up the pace. Today, I’m delighted to have finished second here in Pointe-à-Pitre and to be on the podium with Spindrift racing, just behind Loïck (Peyron), who had a good race. "I always believed that I could be competitive with Spindrift 2, despite the doubts of some. With the team, we have adapted the boat especially for solo racing. I’ve proved that it was worth all of that relentless effort and I’m proud of the team for everything they have done to make this project a success. "It was an incredible race with a tough first night. I had to perform close-hauled tacks and weave in and out of cargo ships and fishing boats in 35 knot winds. It was a bit stressful! I lost some ground, but I was able to crank up the pace in the Bay of Biscay and get back in the race. I had two hairy moments off the Portuguese coast when I had to completely release the sheets, but apart from that the ship stayed in good shape. I’ve never pushed so hard in the manoeuvres because I’ve never been this far. But after so much effort it feels fantastic when the boat accelerates. I’ve lost some weight but I’m happy to be here and I had a lot of fun with the boat. "Where I most lost ground on Loick (Peyron) was with the maneouvers. They just took so long and had to be planned very carfully. The maneouvers were so so tough. It is not easy to manage racing the boat and I do not think I could do this alone again. I have never pushed myself like this. It took me 4 hours to to get the gennaker up and spent over 2.5 hours on the bow trying it properly. I had tears in my eyes. The sheer physical effort was unbelievable. "We do need machines like this to be on the podium, but it was so tough. Richard Silvani and Erwan Israel were there and supported me throughout guiding me through the best route and their help was immense. Now I am going to rest and analyse the performance because we do not have long, we are under pressure because next year we are off again. "I am proud and believed I could do it; I was probably one of the only ones in the team to think so. Now is time to have a rest; I do not think I have slept for more than 2 hours over past week and am just shattered. It is time to enjoy the welcome and then have some rest. I am really exhausted. It was the biggest challenge of my life. I am so happy now to be in Guadeloupe. They were eight very hard days. I had a lot of manoeuvres. The speeds were incredible. It was difficult to sleep. My boat is too big for one singlehanded man. It is too heavy at 21 tonnes. 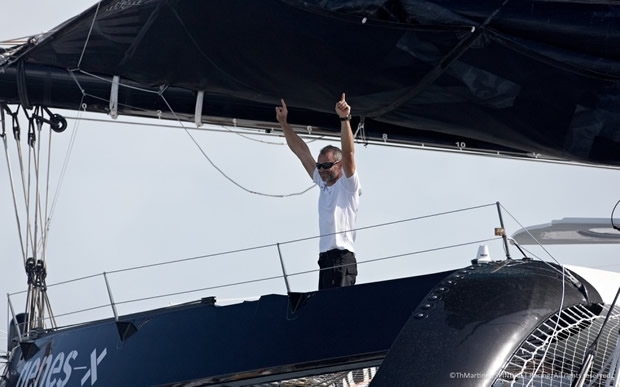 Dona Bertarelli, co-founder and skipper of Spindrift racing added: "Yann's performance showed his immense talent. Given the weather forecast at the start of the race in Saint-Malo, few believed he could be competitive and obtain a podium finish. This second-place finish rewards not only his determination but also his firm belief that Spindrift 2, the world's largest racing multihull, could be sailed single-handed, despite being designed for a 14-man crew. His success is thanks to the work of the entire team and the support of our partners, Mirabaud, Genes-x and Zenith. I would like to thank them for their trust in our team." When the race begin in Saint-Malo just over a week ago, Guichard made a conservative start, aware that with so many boats out on the water, safety was a priority. Safety was also a prime concern in the English Channel, so Spindrift 2 headed north-west before making the turn into the Atlantic well clear of the tip of Brittany. The boat even sailed undercanvassed during the first night, as the weather front that had been forecast swept its way across the fleet at speeds of more than 35 knots, with gusts reaching 45 knots. The storm produced the race's first victims. Thomas Coville, one of Guichard's main rivals in the Ultimes class, retired after his boat, Sodebo, collided with a cargo ship. A few hours later, Loïck Peyron rounded the tip of Brittany in the lead, while Yann, back in sixth position, decided to step on the gas. Sailing close-hauled in waves of more than 5 metres, the skipper increased the sail area, crossing the Bay of Biscay with only two reefs in the mainsail. By Cape Finisterre, Spindrift 2 had moved up to second position, where he remained until the end of the race. The wind veered as Guichard left Europe in his wake. Leaving Portugal, Gibraltar, Morocco and then Madeira to port, he notched up the nautical miles, but speed came at a price. In the early hours of Wednesday morning, he had to unfurl the full sail and, more importantly, hoist the gennaker. It required four hours' effort in all, leaving him exhausted and on the brink of tears. On day three, Loïck Peyron managed to sneak into a weather window and build up an insurmountable lead, despite a crack towards the front of the boat, which proved to not have any serious effects. The Spindrift 2 skipper, meanwhile, had to do without one of his autopilots, after it stopped working. Back on dry land, the team conducted an initial diagnosis. The system had taken a lot of damage during the atrocious conditions at the start of the race and could not be repaired. The solo skipper thus had to put his entire trust in the second autopilot, completing the race with a sword of Damocles above his head, since it would be impossible to sail single-handed without an autopilot. Despite the problems, Spindrift 2 began to lengthen her stride. The fluid routes taken by the fleet show that the sailors were really on the ball, despite the irregular easterlies, often disrupted by squalls. Under a larger-than-normal full moon, Yann put in a huge effort on Friday evening to close the gap to within 118 miles of Banque Populaire VII. During the night, however, he was caught out by an immense cloud that completely broke the trade winds and, by early morning, Loïck Peyron was marching to victory. After reaching Guadeloupe at dawn, Yann performed the final manoeuvres to circle around Basse-Terre and celebrate his prowess in Pointe-à-Pitre. Indeed, never before has one man sailed a 40 metre maxi trimaran alone, finishing in second place on the podium.